Sea Ray is a company who produces a same-named brand of pleasure boats. The company currently operates as part of the Brunswick Boat Group. Sea Ray designs, manufactures and markets boats ranging from 17-foot power cruisers to over 65-foot yachts, including the Sundancer brand. 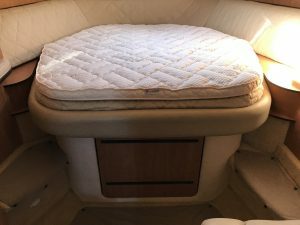 Here, we see the images of the stateroom of Sea Ray 320 Sundancer. The pictures sort of tell the whole story here. The stock mattress goes under the bolster that surrounds the bed, so a great way to add comfort would be to add a topper. 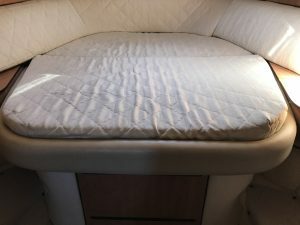 The topper would sit up against the bolster and our custom fitted sheet would fit onto the topper, and the flat sheet would cover the topper and stock mattress, which makes making the bed much easier. We all can imagine what a night mare it can be making the bed and fixing the sheets in this particular case but our designer’s solution to add a topper with sheets fitting right on it saves our customer stress and time. All our toppers are made using a 2” layer of soft latex thick to provide a plush layer of comfort and are made from the same materials as our mattresses. We custom make your topper to fit your existing mattress and include a nonslip underling to keep everything in place. Wrapped in bamboo and finished just like a mattress, our toppers offer a mold and mildew resistant solution to your comfort problem. If you are not fond of latex, we also have the option of memory foam topper using 2” layer of memory foam and then wrapped in our bamboo quilting. Adding a custom topper to your mattress is a cost-effective way to extend the life of your existing mattress. Feel free to visit our website or give us a call. We have more than 1000 boats on file and there is a very good chance your boat is one of them. We are your one stop for all your bedding needs. 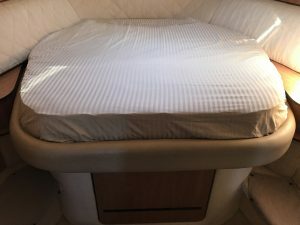 Mattresses, topper, sheets, duvets, coverlets, pillows, blankets, you name it and we have it all custom made for your specific boat. Everyone deserves a good night sleep on their yacht so don’t wait and let our design team help you make your stateroom a STATEMENT ROOM!